Not to be confused with Owens Corning. Corning Incorporated is an American multinational technology company that specializes in specialty glass, ceramics, and related materials and technologies including advanced optics, primarily for industrial and scientific applications. The company was named Corning Glass Works until 1989. 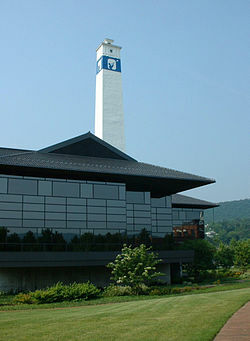 Corning divested its consumer product lines (including CorningWare and Visions Pyroceram-based cookware, Corelle Vitrelle tableware, and Pyrex glass bakeware) in 1998 by selling the Corning Consumer Products Company subsidiary (now known as Corelle Brands) to Borden, but still holds an interest of about 8 percent. As of 2014[update], Corning had five major business sectors: display technologies, environmental technologies, life sciences, optical communications, and specialty materials. Corning is involved in two joint ventures: Dow Corning and Pittsburgh Corning. Quest Diagnostics and Covance were spun off from Corning in 1996. Corning is one of the main suppliers to Apple Inc. since working with Steve Jobs in 2007 to develop the iPhone; Corning develops and manufactures Gorilla Glass, which is used by a large number of smartphone makers. It is one of the world’s biggest glassmakers. Corning won the National Medal of Technology and Innovation four times for its product and process innovations. Over 147 years later, Corning continues to maintain its world headquarters at Corning, N.Y. The firm also established one of the first industrial research labs there in 1908. It continues to expand the nearby research and development facility, as well as operations associated with catalytic converters and diesel engine filter product lines. Corning has a long history of community development and has assured community leaders that it intends to remain headquartered in its small upstate New York hometown. The California Institute of Technology's 200-inch (5.1 m) telescope mirror at Palomar Observatory was cast by Corning during 1934–1936 out of low expansion borosilicate glass. In 1932, George Ellery Hale approached Corning with the challenge of fabricating the required optic for his Palomar project. A previous effort to fabricate the optic from fused quartz had failed. Corning's first attempt was a failure, the cast blank having voids. Using lessons learned, Corning was successful in the casting of the second blank. After a year of cooling, during which it was almost lost to a flood, in 1935 the blank was completed. The first blank now resides in Corning's Museum of Glass. In 1935, Corning formed a partnership with bottle maker Owens-Illinois, which formed the company known today as Owens Corning. Owens Corning was spun off as a separate company in 1938. The company had a history of science-based innovations following World War II and the strategy by management was research and "disruptive" and "on demand" product innovation. In 1962 Corning developed Chemcor, a new toughened automobile windshield designed to be thinner and lighter than existing windshields, which reduced danger of personal injury by shattering into small granules when smashed. This toughened glass had a chemically hardened outer layer, and its manufacture incorporated an ion exchange and a "fusion process" in special furnaces that Corning built in its Blacksburg, Virginia facility. Corning developed it as an alternative to laminated windshields with the intention of becoming an automotive industry supplier. After being installed as side glass in a limited run of 1968 Plymouth Barracudas and Dodge Darts, Chemcor windshields debuted on the 1970 model year Javelins and AMXs built by American Motors Corporation (AMC). As there were no mandatory safety standards for motor vehicle windshields, the larger automakers had no financial incentive to change from the cheaper existing products. Corning terminated its windshield project in 1971, after it turned out to be one of the company's "biggest and most expensive failures." However, like many Corning innovations, the unique process to manufacture this automotive glass was resurrected and is today the basis of their very profitable LCD glass business. In the fall of 1970, the company announced that researchers Robert D. Maurer, Donald Keck, Peter C. Schultz, and Frank Zimar had demonstrated an optical fiber with a low optical attenuation of 17 dB per kilometer by doping silica glass with titanium. A few years later they produced a fiber with only 4 dB/km, using germanium oxide as the core dopant. Such low attenuations made fiber optics practical for telecommunications and networking. Corning became the world's leading manufacturer of optical fiber. In 1977, considerable attention was given to Corning's Z Glass project. Z Glass was a product used in television picture tubes. Due to a number of factors, the exact nature of which are subject to dispute, this project was considered a steep loss in profit and productivity. The following year the project made a partial recovery. This incident has been cited as a case study by the Harvard School of Business. Company profits soared in the late 1990s during the dot-com boom, and Corning expanded its fiber operations significantly with several new plants. The company also entered the photonics market, investing heavily with the intent of becoming the leading provider of complete fiber-optic systems. Failure to succeed in photonics and the collapse in 2000 of the dot-com market had a major impact on the company, and Corning stock plummeted to $1 per share. However, as of 2007[update] the company had posted five straight years of improving financial performance. The turning point for Corning came when Apple approached it to develop a robust display screen for its upcoming iPhone. Later, other companies also adopted its Gorilla glass screen. In 2019, rumours also came that Corning was making folding glass for Apple for it’s folding iPad and iPhone  . In 2011 Corning announced the expansion of existing facilities and the construction of a Gen 10 facility co-located with the Sharp Corporation manufacturing complex in Sakai, Osaka, Japan. The LCD glass substrate is produced without heavy metals. Corning is a leading manufacturer of the glass used in liquid crystal displays. The company continues to produce optical fiber and cable for the communications industry at its Wilmington and Concord plants in North Carolina. It is also a major manufacturer of ceramic emission control devices for catalytic converters in cars and light trucks that use gasoline engines. The company is also investing in the production of ceramic emission control products for diesel engines as a result of tighter emission standards for those engines both in the U.S. and abroad. In 2007 Corning introduced an optic fiber, ClearCurve, which uses nanostructure technology to facilitate the small radius bending found in FTTX installations. Gorilla Glass, an outgrowth of the 1960s Chemcor project, is a high-strength alkali-aluminosilicate thin sheet glass used as a protective cover glass offering scratch resistance and durability in many touchscreens. According to the book Steve Jobs by Walter Isaacson, Gorilla Glass was used in the first iPhone released in 2007. On October 25, 2011 Corning unveiled Lotus Glass, an environmentally friendly and high-performance glass developed for OLED and LCD displays. Corning invests about 10% of revenue in research and development, and has allocated US$300 million towards further expansion of its Sullivan Park research facility near headquarters in Corning, New York. Corning Incorporated manufactures a high-purity fused silica employed in microlithography systems, a low expansion glass utilized in the construction of reflective mirror blanks, windows for U.S. space shuttles, and Steuben art glass. The number of Corning facilities employing the traditional tanks of molten glass has declined over the years, but it maintains the capacity to supply bulk or finished glass of many types. Corning is engaged in research and development on green lasers, mercury abatement, microreactors, photovoltaics, and silicon on glass. Through its Life Sciences division, the company offers products to support life science research, including stem-cell culture products. Corning employs roughly 51,500 people worldwide and had sales of $11.29 billion in 2018. The company has been listed for many years among Fortune magazine's 500 largest companies, and was ranked #297 in 2015. Although the company has long been publicly owned, James R. Houghton, great-great-grandson of the founder, served as chairman of the board of directors from 2001 to 2007. Over the years Houghton family ownership has declined to about 2%. Wendell P. Weeks has been with the company since 1983 and as of March 2013[update] was chairman, chief executive officer, and president. Over its 160-year history Corning invented a process for rapid and inexpensive production of light bulbs, including developing the glass for Thomas Edison's light bulb. Corning was the glass supplier for lightbulbs for General Electric after Edison General Electric merged with Thomson-Houston Electric Company in 1892. It was an early major manufacturer of glass panels and funnels for television tubes, invented and produced Vycor (high temperature glass with high thermal shock resistance). Corning invented and produced Pyrex, CorningWare Pyroceram glass-ceramic cookware, and Corelle durable glass dinnerware. Corning manufactured the windows for US manned space vehicles, and supplied the glass blank for the primary mirror in the Hubble Space Telescope. In July 2008 Corning announced the sale of Steuben Glass Works to Steuben Glass LLC, an affiliate of the private equity firm Schottenstein Stores Corporation. Steuben Glass had been unprofitable for more than a decade, losing 30 million dollars over the previous five years. In February 2011, Corning acquired MobileAccess Networks, an Israeli company that develops Distributed antenna systems, which are often used by universities, stadiums and airports to ensure seamless wireless coverage throughout a facility. MobileAccess Networks became part of Corning’s telecommunications business unit. In July 2017, Corning acquired SpiderCloud Wireless. Donald W. Blair: retired executive vice president and chief financial officer, NIKE, Inc.
Richard T. Clark: retired chairman, president and chief executive officer, Merck & Co., Inc.
Robert F. Cummings, Jr.: retired vice chairman of investment banking, JPMorgan Chase & Co.
Kevin Martin: vice president, mobile and global access policy, Facebook, Inc.
Corelle Brands LLC, the current name adopted by the Corning Consumer Products Company subsidiary that was sold to Borden in 1998. ^ a b c d e "Corning, Form 10-K, Annual Report, Filing Date Feb 6, 2017". secdatabase.com. Archived from the original on March 28, 2017. Retrieved August 19, 2017. ^ "Corning, Form S-3/A, Filing Date Jan 18, 1994". secdatabase.com. Archived from the original on May 24, 2013. Retrieved March 28, 2013. ^ "Corning, Form 8-K, Current Report, Filing Date Jan 13, 1997". secdatabase.com. Archived from the original on May 24, 2013. Retrieved March 28, 2013. ^ Aamoth, Doug. "A Story About Steve Jobs, Steel Balls and Gorilla Glass (You, with the Cracked Phone: Read This)". Archived from the original on April 24, 2017 – via techland.time.com. ^ "One of the world's oldest products faces the digital future". The Economist. October 12, 2017. Archived from the original on October 14, 2017. ^ "1986 Laureates- National Medal of Technology and Innovation". USPTO.gov. Archived from the original on October 6, 2016. Retrieved September 24, 2016. ^ "1994 Laureates- National Medal of Technology and Innovation". USPTO.gov. Archived from the original on October 6, 2016. Retrieved September 24, 2016. ^ "2000 Laureates- National Medal of Technology and Innovation". USPTO.gov. Archived from the original on December 24, 2016. Retrieved September 24, 2016. ^ "2003 Laureates- National Medal of Technology and Innovation". USPTO.gov. Archived from the original on October 6, 2016. Retrieved September 24, 2016. ^ "Corning Chairman Emphasizes Sustainable Performance and "Unwavering" Commitment to Innovation". Corning.com. April 24, 2008. Archived from the original on June 12, 2011. Retrieved August 5, 2010. ^ "Caltech Astronomy: History - 1908–1949". Caltech. n.d. Archived from the original on May 11, 2008. Retrieved March 17, 2008. ^ a b c d Clarke, Sally H.; Lamoreaux, Naomi; Usselman, Steven (2009). The Challenge of Remaining Innovative: Insights from Twentieth-Century American Business. Stanford University Press. p. 99. ISBN 9780804758925. Retrieved September 7, 2011. ^ Flint, Jerry M. (November 27, 1968). "New Windshield for Cars Called Safer in Crashes". The New York Times. p. 53. Archived from the original on November 3, 2012. Retrieved September 7, 2011. ^ a b c d Dyer, Davis; Gross, Daniel (2001). The generations of Corning: the life and times of a global corporation. Oxford University Press. pp. 302–303. ISBN 9780195140958. Retrieved September 7, 2011. ^ Jeff Hecht. "Fiber Optic History | Jeff Hecht". www.jeffhecht.com. Archived from the original on November 20, 2015. ^ "Large Generation Glass". Corning Incorporated. Archived from the original on August 23, 2011. Retrieved September 7, 2011. ^ "Gorilla Glass Overview". Corning.com. December 31, 2007. Archived from the original on November 20, 2010. Retrieved November 26, 2010. ^ Isaacson, Walter (2011). Steve Jobs. Kindle Locations 8137-8141: Simon & Schuster, Inc..
^ "Corning, Form 10-K, Annual Report, Filing Date Feb 13, 2012" (PDF). secdatabase.com. Archived (PDF) from the original on May 24, 2013. Retrieved March 28, 2013. ^ "Corning Unveils Corning Lotus™ Glass for High-Performance Displays". Corning.com. October 25, 2011. Archived from the original on October 28, 2011. Retrieved October 27, 2011. ^ "Corning to Distribute Biological Industries' hPSC Medium". Genetic Engineering & Biotechnology News (Paper). 36 (14): 8. August 2016. ^ "Corning, Form DEF 14A, Filing Date Mar 11, 2013". secdatabase.com. Archived from the original on May 24, 2013. Retrieved March 28, 2013. ^ Davis Dyer, Daniel Gross (June 21, 2001). The Generations of Corning: The Life and Times of a Global Corporation. books.google.com. Oxford University Press. p. 80. Archived from the original on May 11, 2018. ^ "Corning Reaches Agreement to Sell Steuben". Corning Incorporated. July 23, 2008. Archived from the original on August 28, 2008. ^ "Corning Acquires SpiderCloud Wireless". Corning Incorporated. Archived from the original on October 4, 2017. ^ "Board of Directors - Investor Relations - Corning". Archived from the original on March 10, 2016. Gardiner, Bryan (September 24, 2012). "Glass Works: How Corning Created the Ultrathin, Ultrastrong Material of the Future". Wired. "The Trials of Amory Houghton Jr". Forbes. September 1977. This page was last edited on 6 April 2019, at 20:42 (UTC).